There is a National Numbering Plan in the UK that is designed to be easy to understand and consistent across the country. The plan shows what numbers are used by different types of service. Depending on what TalkTalk package you have bought, the prices will vary and we recommend that you look to www.talktalk.co.uk/pricing for more detailed information about the price of calling from a TalkTalk line. If you still have questions about a number on your bill, you can get further detail on our Common Number page talktalk.co.uk/commonnumbers. Just type in the number at the top of the page and it will explain a non-geographic number (e.g. business, government, discounted numbers etc). The table below shows the major categories of numbers. National geographic numbers in the UK. National non-geographic numbers with calls charged at or below rates for geographic numbers. Numbers that are free to call. National numbers that are free to call. National numbers for Internet for school services. Numbers for special services where premium rate call charges apply. Dialling 141 before you dial a number means that your number will be withheld. This service is called blocking your calling line identity (CLI). Not used in the National Number Plan, but may be used for local dialling to geographic numbers and as ‘short codes’ from mobile telephones. Unfortunately, we are unable to change the date your bill is sent out and hence the date your direct debit is extracted. Your first TalkTalk bill is produced approx 1 month after you sign up and all subsequent bills will be on this date of the relevant month. Due to system limitations this date cannot be changed. View More: TalkTalk Can I change my direct debit date? Are there charges for late payments? You may incur late charges if we have not received payment for your TalkTalk services on or before the bill date shown on your bill. The amount you will be charged depends on whether or not direct debit details are set up on your account. If no direct debit details are set up on your account at the time of your bill date, you will be charged £4.50. If direct debit details are set up on your account, but the payment has been rejected, you may be charged up to £10.00. You can view your bill online at My Account. If you are not registered for online billing, please see: How do I sign up for online billing? 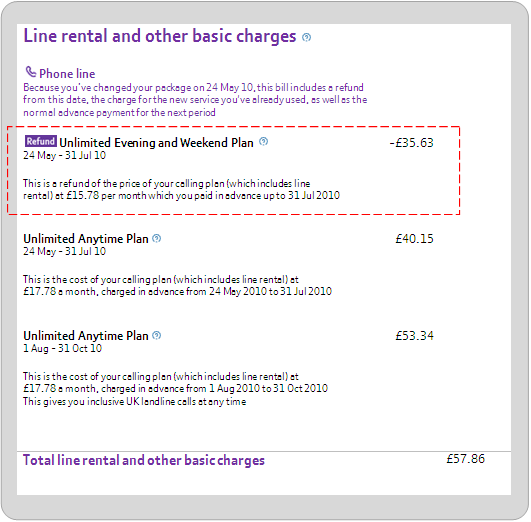 View More: TalkTalk Are there charges for late payments? How do I set up Direct Debit by post? The fastest way to set up Direct Debit is online. Learn how to set up Direct Debit using My Account. Why pay with Direct Debit? Setting up Direct Debit means less hassle for you, and ensures that we can collect the right amount of money from your bank account on the correct date. We will notify you at least three days in advance of collection and all you have to do is ensure that there are sufficient funds in your bank account to pay the amount. Spend less time every month doing paperwork. Avoid the risk of your phone or broadband being disconnected or your account being suspended due to a delay in payment. It's free -- avoid any unnecessary fees. Use these directions to set up Direct Debit by post. Alternatively, learn how to set up Direct Debit using My Account. Download and print the Direct Debit mandate form. Note: It takes seven days to process a direct debit form from the day that we receive it. If you are changing banks, or your mandate will not be set up in time, please make an online payment now to allow time to process your Direct Debit form. View More: TalkTalk How do I set up Direct Debit by post? It's quick and easy to make a one-off credit card payment with My Account. It's the fastest way to pay your TalkTalk balance. If you don't use My Account already, first you'll need to register for My Account. If the address used in My Account is the registered address for your credit or debit card, you'll need to select Enter a different address. If you are entering a different address, and it is a UK credit or debit card, you can search for the address by entering the House name or number and Postcode, and clicking Look up. If you do this, the address will automatically be entered into the address box. If the address is not found, or if it is a non-UK card, you must manually enter the address. If you owe money, the payment amount box will automatically display the same amount as the account balance in the summary at the top of the screen. If you want to change this amount, simply enter the new amount you wish to pay. Once you are happy that all of the details are correct, click Make payment. Note: Once you have clicked the Make payment button, you will be asked to confirm, cancel or modify your payment. Once you click Confirm, do not refresh the page or click the back button on your browser. This is to prevent a duplicate payment being made. If the payment was processed successfully, you will see a confirmation screen where you canprint a receipt or continue to the My Account Summary screen. The successful payment will be visible on My Account the next time you sign in. If the payment does not go through then you will see a pop-up message explaining that the payment request failed and the payment could not be taken. It will also explain whether payment was not processed due to authentication failure, card verification failure or payment decline. If this happens, you can try another card, or Contact us. If you have Direct Debit set up with TalkTalk and you make a one-off payment online within 2 working days of the Direct Debit extraction date, the Direct Debit will be taken in addition to the one-off payment. If this applies to you, a notice will be displayed at the top of the One-off card payment screen when you follow the steps below. View More: BT How can I pay my bill? When you change your telephone calling plan, calling feature, a broadband or BT Vision package (like changing from a Silver Value Pack to a Gold Value Pack) you may get a bill that's confusing or looks like you've been charged twice. On the same bill, Mr. Smith is charged for that same period of time for his new Unlimited Anytime Plan - highlighted below. 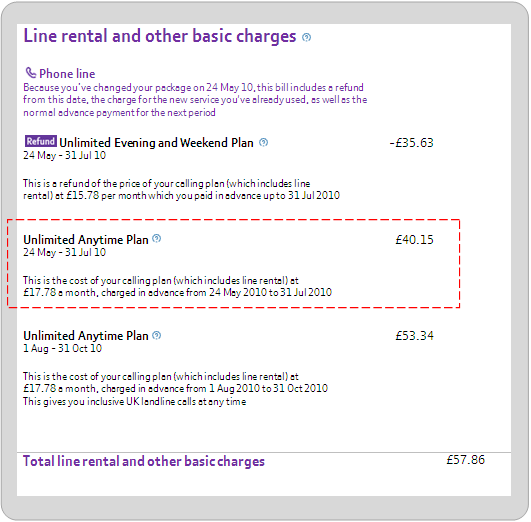 Mr. Smith is also charged the standard advance charges for his new Unlimited Anytime Plan for the period of the new bill (1st August to the 31st October) - shown below the highlighted area in the picture above. Note: charges used in the above images are for demonstration purposes only and do not reflect actual prices. If you're being charged for equipment (such as a rented phone or bell), which you no longer have, please contact us using the link below. If you've taken up the Line Rental Saver Offer, your next bill will be adjusted to include the payment you have made. If you pay your bill by Monthly Payment Plan, your monthly payment may also be adjusted. What is 'My BT?' Where's Your Account? "Your account" is changing to "My BT". My BT has everything you need online - you can view and download your bills 24/7, manage all your services, track your orders, get the latest offers and help - and much more. Manage your bills and payments, set up or change Direct Debits, analyse your usage and get detailed copies of previous bills. Upgrade your calls, broadband or TV package, learn about our latest offers, add-ons and updates. Learn how to get the most out of your BT products, find out what's new on BT Vision, enter competitions and more. Get in touch via email, chat to BT experts online and follow us on Twitter. Troubleshoot problems, find fixes and tips, download user guides and watch step-by-step video demos. Join discussions and share advice with other customers on the BTCare Community forums. View More: BT What is 'My BT?' Where's Your Account?